At my neighborhood grocery store here in Des Moines there's a new sign above the eggs section informing shoppers that none of the products are affected by the massive egg recall involving two Iowa farms. And there's more good news: the egg-on-a-stick giveaway at the Iowa Egg Council's booth at the Iowa State Fair, which ended on Aug. 22, remained popular. "People didn't really shy away from the product. They understand it's a great food," says Kevin Vinchattle, executive director of the producer trade group. Still, some fairgoers had questions about the national recall. After all, it was prompted by a salmonella outbreak that has sickened as many as 1,300 people across the country  though none in Iowa. Iowans worry that the recall of a half-billion eggs could tarnish the reputation of Iowa's egg industry  which will produce 15 billion eggs this year  or lead to a decline in egg consumption. "Everybody has got to be a little nervous about what the impact can be and that all Iowa egg farms can get tainted with the same brush," says Iowa Agriculture Secretary Bill Northey. "It's important that folks know that those eggs have been recalled and that the other eggs are safe. This could happen anywhere." The two Iowa farms involved in the recall are connected to DeCoster Farms, whose founder, Jack DeCoster, has a reported history of violating environmental laws and labor rules. Food and Drug Administration Commissioner Margaret Hamburg said in a television interview on Aug. 22 that the Iowa farms involved were not operating responsibly before the salmonella outbreak. An initial on-site inspection by FDA staff at the two farms may produce findings by next week. Hinda Mitchell, a spokeswoman for Wright County Egg  a DeCoster company that has recalled 380 million eggs produced since May  says the company has not yet received a written report from the FDA. "Any concerns that were raised verbally to us during that [FDA] visit have actually already been addressed or are in the process of being addressed," she says. "This is consistent with how we've handled this process overall ... when issues are raised, we address them swiftly and effectively." The recall could fuel the debate over "corporate" or "factory" farms, which has roiled rural Iowa and beyond, with critics arguing that the recall further exposes the health and safety hazards of such farms. A poultry expert tells TIME of a visit to Wright County Egg last spring and seeing huge numbers of chickens raised under one roof, often in tiers of small cages, each containing several birds. "When you [put] things in that high a concentration, you're going to have big problems," says Jim Yungclas, who lives on a farm in Wright County, home to Wright County Egg. Hillandale Farms, which used DeCoster hens and feed, recalled 170 million eggs. The recall "is a black eye for policies that we have in Iowa. The state could do a lot to make agriculture more friendly toward farmers and not corporate agriculture," says Yungclas, a board member of Iowa Citizens for Community Improvement. Yungclas' group fights large animal-confinement operations, arguing that they cause air and water pollution, threaten food safety and concentrate control of the food supply in a few corporate hands. A former Iowa State University Extension county director who helped farmers adapt to new agricultural methods, Yungclas is now retired. He eats the eggs from the eight chickens on his farm, which his wife's family has owned for 115 years. But Agriculture Secretary Northey counters, "This is nothing to do with the size of farms. Something like this could happen with smaller farms or larger farms." Catherine Strohbehn, an Iowa State University Extension specialist, reports that the Extension's 11 nutrition and health field specialists have received calls from concerned consumers. "We haven't really gotten any panic," she says. "Here in Iowa, many people have roots from the farm or understand the agricultural process and that we can't have 100% sterile food. Especially with raw agricultural products, we're going to have potential contaminants. That's why there are rules and recommendations to mitigate those risks." 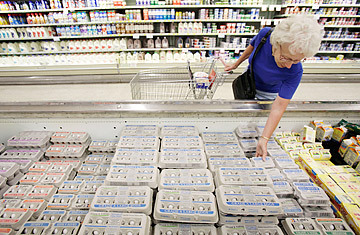 Strohbehn recently threw out a half-eaten carton of recalled eggs from her refrigerator. The recall, she says, has some asking why the FDA's initial regulations for egg-safety production  formulated in 2009  didn't go into effect earlier than July 9, 2010, or why the involved farms weren't inspected earlier. The regulations include testing, sanitation and refrigeration requirements for egg operations and allow the FDA to inspect farms for compliance. So far, Strohbehn says, the recall seems to be prompting more questions about DeCoster than Iowa egg farms. Iowans' "reputation as being hardworking, industrious, honest people is preventing them from getting a bad reputation," she says. Kevin Vinchattle is quick to note that the recall "is not a common occurrence." "Iowa egg farmers are all about producing a safe, healthy, wholesome product," he says. "I'm hopeful that in the long run, people will see that we responded in a responsible manner and that there are things to be learned from this." See pictures of urban farming around the world.